In February 2013, City of Los Angeles unveiled its first pair of parklets. Six months forward, UCLA Luskin and affiliated researchers have found the parklets bring an improved quality of life to residents and visitors along the Spring Street corridor. In an evaluation (PDF) completed as a part of the “Reclaiming the Right of Way” project, researchers at UCLA Luskin’s Complete Streets Initiative and the research collaborative Parklet Studies monitored various elements one would find in a thriving urban street setting — including pedestrian and bike traffic, use of public space, and patronage of local businesses — to gauge how the neighborhood has changed since the parklets were installed. Parklets are small public spaces created in urban areas from the conversion of parking spots, alleyways and other underutilized spaces for cars into places for people. Los Angeles joins New York, San Francisco and Vancouver, B.C., in the ranks of cities that have encouraged parklets as innovative solutions to increase access to open space and provide residents opportunities for recreation in their neighborhoods. Two of the four Los Angeles pilot parklet installations, which are located at the ends of a block of Spring Street in Downtown’s Historic Core, offer local residents a place to sit and relax in the busy city center. The northern installation includes a large, tall table; stools and swing chairs for sitting; and two stationary bicycles for active recreation. The southern unit features design elements that evoke a park and playground, two more stationary bicycles, and a foosball table. Visitors to Spring Street and the cafes adjacent to each parklet can eat their food on the tall bar-style table, moveable low tables or groupings of swing chairs. By comparing year-over-year data, the team found that a more vibrant, lively community has grown around the Spring Street parklets. The parklets appeared to contribute to the walkable neighborhood on Spring Street, with data showing that 50 percent of visitors to the area in 2012 arrived by foot, while in 2013, 63 percent of area visitors were pedestrians. 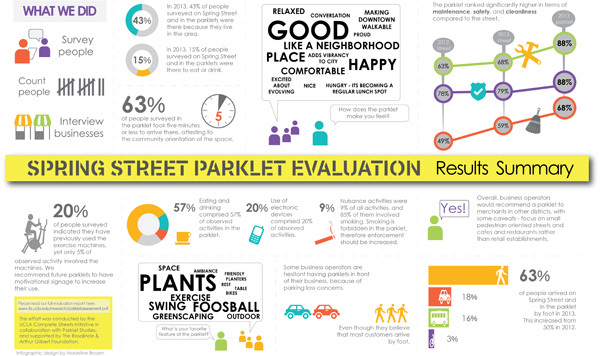 The team found that 63 percent of parklet users were local residents. The parklets also helped improved perceptions of the area, with positive reports of maintenance (63 percent vs. 88 percent), safety (78 percent vs. 88 percent) and cleanliness (49 percent vs. 68 percent) all increasing with statistical significance from 2012 to 2013. Many business owners in the area, while a bit concerned about the loss of parking, told the researchers they would recommend parklets for merchants in other districts, especially those on small, pedestrian-oriented streets with cafes or restaurants in the area. The parklets were designed by a community coalition led by the Downtown Los Angeles Neighborhood Council’s Complete Streets Working Group, bringing together researchers from UCLA Luskin and Parklet Studies, and with funding from the Rosalinde and Arthur Gilbert Foundation. The three-phase project included the development of a parklets toolkit, identifying best practices for constructing pocket parks in cities around the country; two demonstration parklets in downtown Los Angeles; and the formal evaluation of the parklets’ impact on the local community. Accordingly, the research methods and metrics developed as a result of this effort are currently informing the Los Angeles Department of Transportation’s formalization of a citywide program for plazas, parklets and bicycle corrals, a program that will seek to infuse pre- and post-evaluation into its structure and, in turn, overall department practices. Going forward, the project partners and the City hope to see their work and the citywide program spur interest in the design and construction of parklet projects in other parts of Los Angeles, as well as other cities around the country. The Parklet Toolkit earned recognition from planning and development groups, most recently being named the winner of the 2013 Planning Achievement Award for academic projects from the American Planning Association’s California chapter. The full evaluation report, along with the parklet toolkit, are available at the UCLA Complete Streets Initiative website.